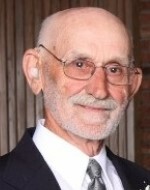 Donald J. Roth, 87, of Wayland, IA, passed away Wednesday, February 6, 2019, at Pleasantview Home in Kalona, IA. Born October 27, 1931, in Milford, NE, Donald Joseph was the son of Jacob and Hannah (Unternahrer) Roth. He moved with his family to Iowa as a young teenager and was a 1949 graduate of Wayland High School. On October 5, 1952, he married Aldine E. Roth at Sugar Creek Mennonite Church. She preceded him in death on September 4, 1986. Don later married Arline E. Neff Roth on June 27, 1987. She survives. Don was a lifelong farmer and considered raising cattle his hobby as well. He was a member of the Sugar Creek Mennonite Church, where he taught Sunday School, served on the church board and in other offices. In addition to his wife, Arline, Don is survived by four children; Stephana (Lee) Fraum of St. Louis, MO, Celeste (Michael) Brown of Indianapolis, IN, Reginald (Deb) Roth of Wayland, IA, and Carey (Tami) Roth of The Villages, FL; eight grandchildren; and ten great-grandchildren. Also surviving are three sisters, Anna Mae Roth of Milford, NE, Eldora Boshart of Wayland, IA, and Alice (Gene) Wyse of Wayland, IA; and one brother, Urban (Marcia) Roth of Wayland, IA. Donald was preceded in death by his parents and his first wife, Aldine., along with two brothers-in-law, Earl Roth and Don Boshart.